Priming the Last Parts of the Empennage! Well, tonight was priming night, and its the last priming session for the entire empennage! I am kind of glad to be honest, spraying AKZO is an ordeal with all the PPE and prep work that has to be done. However, it leaves an absolutely awesome primed surface, that is incredibly durable so I guess its worth the trouble. I only had a few remaining parts from the left elevator that needed priming, and I have decided I am not priming the trim tab. Its a super small piece, and the assembly work left the trim tab fairly closed, so I wouldn’t get much coverage in it anyways. Even if the trim tab starts corroding (it won’t its alclad), the entire thing will cost about $50 in parts to replace, and maybe 8 hours of work. The trim tab finished out so well, that I didn’t want to chance ruining it by trying to prime it. Here’s my obligatory priming selfie!!! Like all priming sessions, I started out by scuffing up the parts with maroon scotchbrite pads. These things work great at scuffing the alclad surface, but not removing it. I essentially am just removing any of the alclad surface corrosion and giving the primer a good surface to “bite” onto. Once I had all my parts scuffed up, I did a quick wipe with a microfiber cloth to remove the dust that scuffing leaves behind. I have found this small step makes it WAY easier to clean with acetone. Once I had the dust off the parts, I cleaned each one with acetone 3 times each and using a clean side of a paper towel every time. I like to clean the parts until the white paper towel pulls away clean from the part. Then, I mixed up the AKZO and let it kick-off for the 30 minutes it needs, stirring it occasionally. I made 4 ounces of AKZO for this small batch and then poured it into the PPS cups for my HVLP sprayer. 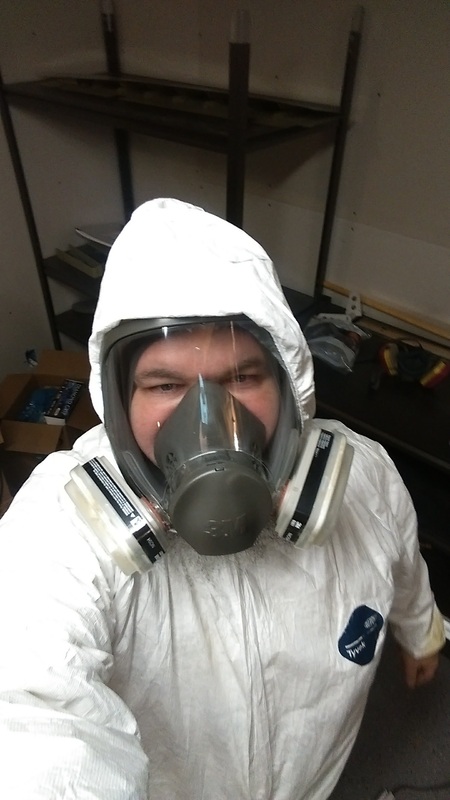 While the AKZO was kicking-off, I suited up into my tyvek suit, donned my full face mask and sealed off the spray booth and ventilated it outside. Like usual, AKZO sprays super easy, and covers wonderfully with an HVLP. Usually once quick pass is enough to cover the part completely, with only needing a few small touch up’s in the shadowy areas. Tagged Priming, Left Elevator, Lynn. Bookmark the permalink.